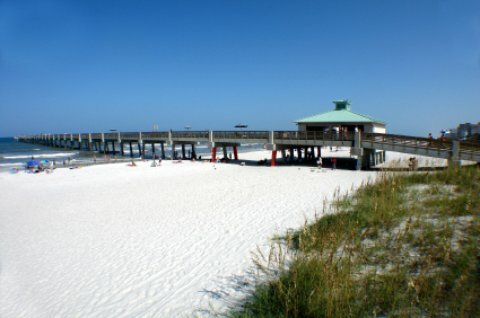 Jacksonville Beach Florida has a fabulous fishing pier and a beach that beckons. Jacksonville Beach Florida, with its' sisters, Neptune and Atlantic Beach, are ideal beaches to visit when you need some good ol' Sand and Sun Therapy. These three sister beaches, referred to by the locals as, "Jax" beaches, are laid-back and relaxing but visit all three. Everyone has a favorite and you may have a preference! Bring YOUR OWN sisters and enjoy some of Florida's best beaches! than the other two and no crowds so if you are looking for a relaxing day, or week, or even months, come on down to Jax. Jacksonville Beach Florida proper has a population over 20,000 residents but it emits a homey, beach town feel. Maybe its the friendliness of the natives! If you’re planning a visit, high season summer months are best. If you come during the winter months, bring a jacket for night time. Whatever water sports activities you can dream up, you can probably rent in one of the stores around the beach. Don’t be timid to ask to join a volley ball game in progress. Beach bums are usually very friendly. Be sure to visit Jacksonvile's other two beaches. They are also written up and featured on this website so here is a link to Atlantic Beach and the other sister beach, Neptune Beach. Take a load off and catch some dinner off of the Jacksonville Beach Fishing Pier. If you like art or are botanically inclined, take a few hours to explore the Cummer Museum of Art & Gardens. Pablo Historical Park you can learn all about the history of the area and Pablo Beach, which is what Jax Beach used to be called until 1925. Take a ride on North Florida Charters and scuba dive or snorkel to see amazing coral reefs and remains of shipwrecks. You can also learn how to spearfish. Kids of most ages: Adventure Landing not only offers your typical water park activities but also has many for those who enjoy dry land as well such as put-put, a game arcade, batting cages, go carts and even Haunted Houses or other seasonal attractions. Eating: Take a break from beach bumming or surfing and enjoy some delicious tacos at TacoLu or dine on some tasty seafood at Salt Life Food Shack. Sleeping: Best Western Oceanfront is right on the beach as the name implies and is close to all of the shopping, restaurants and attractions. For a cozy feel, stay in the Casa Marina Hotel and Restaurant.